Arthur Frederick Bennett (16 September 1871 - 14 May 1937), FRAS, MICE , MINA , was the son of John Bennett, a ship owner of Goole, Yorkshire. He began his working career apprenticed to Messrs Earles' Shipbuilding & Engineering Company at Hull. In 1902, he left Earles' and became general manager of Messrs Willans & Robinson Ltd at Rugby. In 1921, the firm amalgamated with the English Electric Company, Ltd and Bennett left, joining Richard Garrett & Son, Ltd at Leiston, Suffolk as general manager and a director. (He remained with the firm until it went into receivership in 1932.) 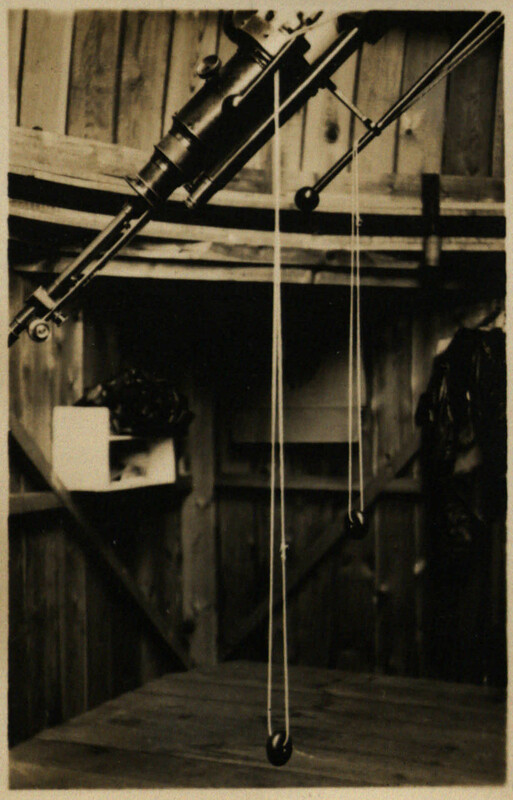 His colleagues at Willans & Robinson presented him, on departure, with a 3" Watson refractor and this appears to be what stimulated his interest in astronomy. Bennett became a member of the BAA (British Astronomical Association), the RAS (Royal Astronomical Society) and the ASP (Astronomical Society of the Pacific). He was an active member and office-holder of the BAA and there is therefore a good historical record of his activities in the JBAA (Journal of the BAA). He submitted annual reports to the RAS (and a report on the transit of Mercury of 1927) and these appeared in MNRAS (Monthly Notices of the RAS). The details below are based largely on material in JBAA and MNRAS. On 28 June 1922, Bennett was elected a member of the BAA, proposed by Alice Grace Cook, seconded by J P M Prentice [3, 4]. (Cook and Prentice were BAA members living in Suffolk.) Bennett was a very active member of the BAA, attending and speaking at many meetings (details below). In 1926, he was co-opted onto the Council of the BAA . At the BAA AGM on 28 October 1931 [49, 50], he was appointed Treasurer. He served until 1933, stepping down at the AGM on 25 October of the year, being succeeded by Rev Dr Martin Davidson [57, 66]. On retiring as Treasurer, he held office as a vice-president for a year [67, 74]. When, in 1936, Davidson was elected President, Bennett again served as Treasurer , remaining in post until his death the following year. Having been proposed and seconded as a member of the BAA by two members from Suffolk, Bennett perhaps felt it his duty to encourage others from East Anglia to join the Association. The individuals whom he proposed or seconded for membership are listed below: more than half were from the region. 1932 Proposed Emily Loweman, Post Office, Little Glemham, Near Woodbridge, Suffolk  and seconded James Patrick Murray Cables, 26 Dacre Park, London, SE13 . 1933 Seconded Oswald D Macnamara, 2 St. George's Road, Bedford . 1934 Proposed Harold Charles Woodhead, Oxford Road, Leafield, Oxford . 1935 Proposed Harry Bulkeley Creswell, 7 Heath Mansions, Hampstead, NW3 . 1936 Seconded Henry Ernest Kersey, FRAS, 10 St. Nicholas Street, Ipswich . 1937 Proposed Herbert Hudson, Great Ruffins, Wickham Bishops, Essex . On 13 February 1925, Bennett was elected a fellow of the RAS. On 26 February 1929, Bennett was nominated a life member of the ASP . His main subject of observation was the Sun and, in particular, spectroscopic studies of prominences, and in this he collaborated with the director of the BAA Solar Section, A M Newbegin, and others. 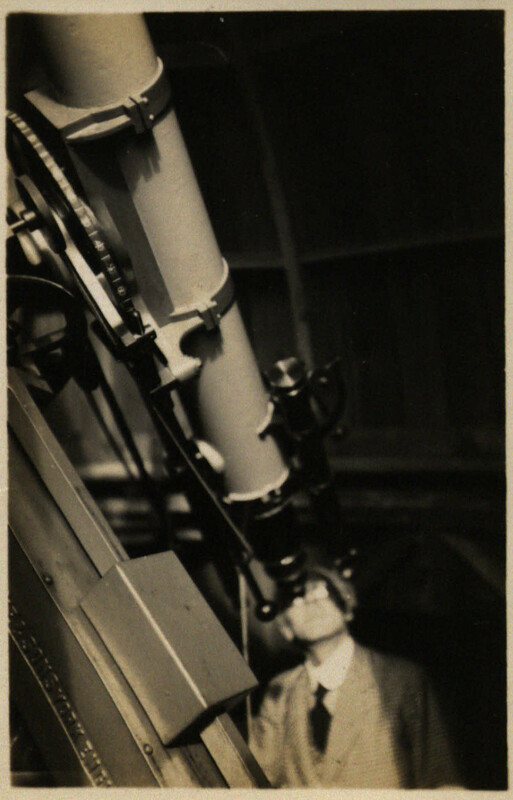 In 1927, he mounted the cameras on the Cooke refractor (so that they would track the motion of the heavens) and used them to search for comets, asteroids and other faint objects including, in 1930, the recently-discovered Pluto [31, 41, 52]. Following an exceptionally dry summer in 1929, he had to adjust the mounting of the Cooke refractor as its alignment had been affected by subsidence of its concrete foundations . In 1930 he obtained a precision clock for the observatory, and used it to time occultations . (The clock appears to have been a Synchronome electric clock .) He also observed, or attempted to observe, other objects and phenomena, including planets, the transits of Mercury of 1924 and 1927, novae, lunar occultations, lunar eclipses, comets, aurorae and meteors. His more noteworthy observations are summarised below. The earliest record of Bennett submitting solar observations to the BAA is at a meeting on 28 April 1926  when he exhibited drawings of prominences and sunspots. The 1926 annual report of the BAA Solar Section  noted that Bennett and A M Newbegin, Director of the Section, had reported many spectroscopic observations of sunspots and prominences, recording very interesting details. Unfortunately, the Section report for the following year  noted that the pair had continued their observations of prominences but that poor weather had resulted in considerable gaps in the record; indeed, in his report to the RAS for 1927 , Bennett commented on the exceptional number of nights in the year which had been completely overcast and, at the 25 January 1928 ordinary general meeting of the BAA , Mr Newton of the Royal Greenwich Observatory noted that Bennett and other observers of prominences had found 1927 disappointing. In 1928, the weather appeared to improve and Section reports [28, 30] noted that Bennett had again maintained his observations of prominences, and that he had observed large disturbances on the limb, each occupying many degrees of circumference, on 08, 09, 11, 14 and 16 July of the year. The Section 1929 report  noted that Bennett had continued observing prominences and sunspots, making drawings and taking photographs when possible. At a BAA meeting on 27 February 1929 , Mr F J Sellers (who went on to become Director of the Solar Section in 1937) gave an account of a great prominence seen on 19 January of the year. Bennett, somewhat underwhelmed, retorted that the only remarkable aspect of the prominence had been the speed with which it had broken up! Later in the year, at a BAA meeting on 27 November , Bennett complimented Newbegin on the quality of his spectroscopic observations of sunspots and then read his paper entitled A Spectroscopic Method of Determining the Times of Contact in the Case of a Solar Eclipse . In the paper, he proposed to employ a spectroscope with a curved slit, aligned so that a bright spectral line of the chromosphere, e.g. Hα, lay along the edge of the slit, and to observe and time the instant when the limb of the Moon obliterated the middle of the bright line. The year 1929 appeared to mark a high point of solar activity for Bennett, and for a few years subsequently he appears to have been less active as a solar observer; his next appearance in JBAA  in relation to solar observing is at the 24 June 1931 BAA meeting discussing arrangements for observing the solar total eclipse visible in the USA in 1932 and later in a discussion provoked by an exhibition of slides of solar prominences. At a BAA meeting on 29 June 1932 , Bennett, Newbegin and Sellers discussed and showed images of a major and very active prominence that they had independently observed on the east limb on 16 June. Once more, there appeared to be slight disagreement between Bennett and Sellers, on this occasion in relation to the size of the feature. A solar total eclipse occurred on 29 June 1927, visible from northern European latitudes. Bennett was appointed to the BAA committee coordinating observing arrangements. As the eclipsed Sun would be at higher altitude and obscured for longer duration in Scandinavia than the UK, Bennett arranged for a quote from Thomas Cooke & Son Ltd for an expedition from London King's Cross to Aal, near Bergen, in Norway, to observe the event. The cost, including first class travel, accommodation, meals and gratuities was estimated  at between £30 to £33 10s per head! Bennett expected some American astronomers to join the BAA expedition . Reminders to members interested in joining the expedition to contact Bennett without delay appeared subsequently [17, 19]. The BAA meeting on 30 March 1927, which was attended by the Astronomer Royal, Sir Frank Dyson, was devoted to discussion of how best to observe the eclipse  and Bennett agreed to provide advance notice to members of the BAA of any prominences that might be visible during totality. Unfortunately, the BAA report of the event  made it clear that Bennett, who decided to observe from the UK, had no luck. He took his 3" telescope and spectroscope to Leyburn, but was unable to make observations due to cloud. Two transits of Mercury took place in the 1920s, and Bennett observed the final stages of both from his home observatory using the 6" Cooke refractor (the earlier stages of both occurred with the planet below the horizon). He timed third and fourth contacts for the transits using a chronometer checked against wireless time signals. On 10 November 1927 he observed the second transit [24, 32] in a perfectly clear sky from just before 08:00 UT until fourth contact at 08:30 UT. He used the Cooke refractor first to project an image then with a solar diagonal. The "Black Drop" phenomenon was very marked, and more clearly defined than he had witnessed three years previously. Reports of the BAA Computing Section and Bennett's annual reports to the RAS list his observations of occultations as below. In some cases, there are discrepancies between the reports. 1928 14 occultations [41, 44]. 1929 13 occultations by the Moon and one by Mars . 1931 eight occultations, including three observed during a total lunar eclipse on 26 September . 1932 three or four occultations (references differ) [68, 69]. 1934 eleven or two occultations (references differ) [89, 103]. 1935 six or zero occultations (references differ) [95, 103]. At a meeting of the BAA on 29 May 1929 , Bennett described observation of a lunar occultation of γ Virginis and an occultation of a magnitude 8.3 star by Mars, both occurring on the same night. (The night appears to have been 21 April 1929, and the star ZC1126 in Gemini, catalogued nowadays as Hipparcos 36161, magnitude 8.8.) For the occultation by Mars, to minimise glare, he made and fitted an occulting bar in the focal plane of a Zeiss orthoscopic eyepiece and arranged the bar to obscure all but the leading image of the planet before disappearance, and all but the trailing limb of the planet after reappearance. Several years later, in 1934, he contributed to a discussion  at a BAA meeting concerning the use of occulting bars. In 1927, Bennett successfully used one of his cameras with Watson "aviation" lens to photograph Comets Stearns (1927d) and 7P Pons-Winnecke . At a BAA meeting on 25 May of the year , he exhibited a photograph of Pons-Winnecke which he had taken on the night of 08 May. The comet was visually faint, only barely discernible in Bennett's 6" refractor, and he had used a one hour exposure to photograph it. The report of the Photographic Section in September of the year  noted that he and others intended to undertake systematic photography of comets. Later, he observed Comet Wilk (1929d) , Comet 1932/P1 Peltier-Whipple and searched, apparently without success, for Comet 10P Temple (aka Temple 2) . On the night of 12 December 1934, J P Manning-Prentice discovered Nova Herculis (DQ Herculis 1934). By the end of the year, members of the BAA had submitted no less than 208 estimates of the magnitude of the object, of which Bennett contributed six . 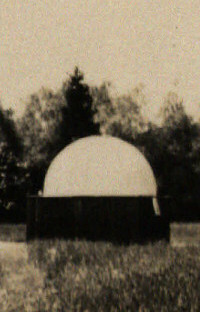 Several observers, Bennett among them, had intended to undertake a programme of telescopic observations of the 1931 Leonids but were thwarted by poor weather . Bennett contributed to many meetings of the BAA. Those not covered above are listed below. 01 January 1930 Ordinary Professor Dinsmore Alter (an astronomer visiting from the University of Kansas) read a paper exploring whether the motions of the planets in their orbits affected sunspot numbers and Bennett contributed to the subsequent discussion. In his report  of the 1924 transit of Mercury, Bennett gave his longitude (in time) as 0h 6m 18.0s E (equivalent to 1° 34' 30" E) and latitude as 52° 12' 2.1" N. In his reports [24, 32] of the 1927 transit, he specified the same latitude but provided longitude in degrees, giving a slightly greater resolution, of 1° 34' 30.2" E. Assuming that Bennett was quoting coordinates relative to the 1830 Airy spheroid adopted by the Ordnance Survey (although he did not state this), and using the transformation described in  to convert to coordinates in the frame of WGS84, enables plotting the location on Google Maps. The WGS84 coordinates equivalent to the 1927 position are 1° 34' 23.6" E, 52° 12' 3.8" N, placing the observatory in Haylings Grove, Leiston. The position accords with the name, Haylings, of the property. The coordinates of Bennett's new location  after mid-1933 were 1° 34' 45.5" E, 52° 11' 58.3" N. The equivalent WGS84 co-ordinates are: 1° 34' 38.9 E, 52° 12' 0.0" N, and the location is just off Goldings Lane, Leiston. Again, the position accords with the name of the property, Goldings. On the occasion of the move, Bennett undertook a thorough comparison of the horizons offered by the old and new observing sites [81, 90, 91], finding the latter much superior. Bennett died on 14 May 1937 and the JBAA for June 1937 [98, 99] carried details of his passing. (Note that  incorrectly lists his date of death as 15 May.) The lawyers handling his estate sold his observatory and equipment . His obituary appeared in the July 1937 JBAA . The report of the Solar Section in the October 1937 JBAA  noted his passing. Subsequently, his daughter, Mrs Carr, presented a gift of £50 to the BAA as a token of her father's regard for the Association and as a memorial to his name . At the November 1937 general meeting of the BAA, the Secretary, F J Sellers, read some titles of the 30 books which Bennett's executors had presented to the BAA . Mrs Carr also presented a calculating machine to the Association . The following image shows his grave at St. Andrews Church, Aldringham, Suffolk. 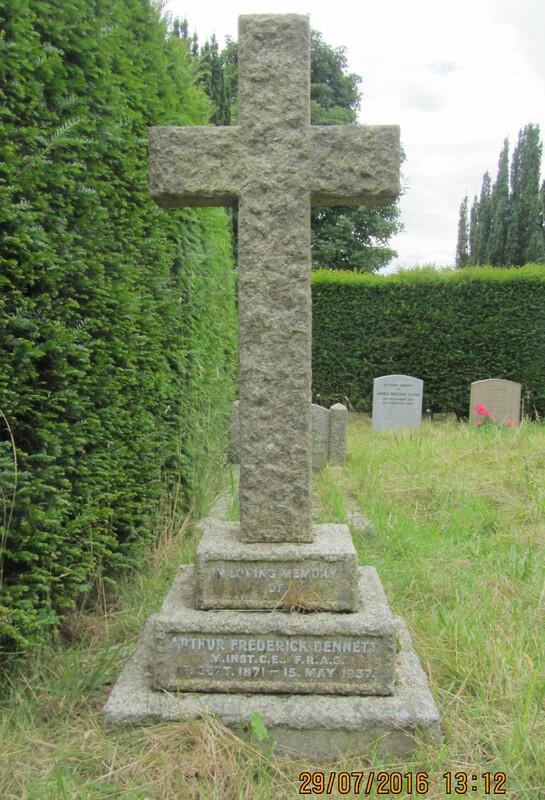 Bennett's gravestone (James Appleton, 29 July 2016). One envelope, addressed to Basil Brown, Rickinghall, Norfolk. An image of the Strasbourg Astronomical Clock. Thank you very much for your letter and the photo. Miss Cook told me of you and I had made a note of your location in the hope of being able to call round + see you one day, which I will certainly try to do in the near future - advising you beforehand. Meantime, if you had an opportunity to come over to this corner of East Anglia I should be delighted to see you + show you my equipment. I am sending you 3 photos, one showing my observatory from the outside and the other two showing the 6 inch Cooke inside. I can quite understand the difficulty you have in finding time enough to follow up your astronomical work. I am by no means a “leisured” man either and have always had the same difficulty. The cheering thing for us to remember is that it is precisely that sort of a man who has often done work for the science in the past, and if workers [three unclear words] the equipment it is still possible to do work that is really useful and helpful to Astronomy. I have never photographed the Zodiacal light. In fact I have only tackled stellar photography so far. I have two 21 inch focus aero type lenses mounted in cameras & strapped to the tube of the equatorial. (Not shown in the photos enclosed, by the way.) These give me a field of 9 or 10 degrees on a 5 inch x 4 inch plate and as the lenses work at f5.8 they are very rapid, and they give me very good images. Long exposures are of course necessary for stellar work (faint comets, nebulae, minor planets +c) so that an equatorial mount is essential. But fortunately nothing elaborate is needed: no doubt you have seen in a recent number of the B.A.A. journal an account by Mr. Collinson of Ipswich of his “Home Made” equatorial, on which he has done some really splendid photographic work. I am expecting a visit from him this week + if he has anything useful to say that seems calculated to help you I will write soon again. Mr. Hargreaves (Director of the Photographic Section, BAA) whose address is [unclear word], Woodland Way, Kingswood, Surrey, would I am sure be only too pleased to give you the fullest information about the probabilities of your camera for astro work if you wrote him - mention my name if you wish. This file also contains a letter from Basil Brown to Dennis Fulcher (dated 23/4/57) stating that he is forwarding the above letter for his "History of Astronomy in Suffolk" project. This letter references the Strasbourg Astronomical Clock, which might explain the included photograph. Member of the Institution of Naval Architects. "Candidates for Election as Members of the Association", JBAA, vol. 32, no. 7, p. 287, 1922. "New Members of the Association", JBAA, vol. 32, no. 8, p. 327, 1922. A F Bennett, "Transit of Mercury", JBAA, vol. 34, no. 7, p. 272-274, 1924. Note that Bennett's observing report quotes event times in GMAT (Greenwich Mean Astronomical Time), 12 hours behind UT (Universal Time). "Report of the Meeting of the Association", 25 February 1925, JBAA, vol. 35, no. 5, pp. 145-154, 1925. "Report of the Annual Meeting of the Association", 28 October 1925, JBAA, vol. 36, no. 1, pp. 1-18, 1925. "Report of the Meeting of the Association", 25 November 1925, JBAA, vol. 36, no. 2, pp. 41-47, 1925. "Report of the Meeting of the Association", 31 March 1926, JBAA, vol. 36, no. 6, pp. 173-180, 1926. "Report of the Meeting of the Association", 28 April 1926, JBAA, vol. 36, no. 7, pp. 217-218, 1926. Dr W H Steavenson, "Two Recent Novae", JBAA, vol. 36, no. 7, pp. 241-243, 1926. "Report of the Meeting of the Association", 30 June 1926, JBAA, vol. 36, no. 8, pp. 269-277, 1926. "Solar Section", JBAA, vol. 36, no. 9, pp. 322-323, 1926. "Eclipse Expeditions and Camps", JBAA, vol. 37, no. 1, pp. 46-48, 1926. "Report of the Meeting of the Association", 24 November 1926, JBAA, vol. 37, no. 2, pp. 49-59, 1926. "Eclipse Committee", JBAA, vol. 37, no. 2, pp. 75-76, 1926. "Report of the Meeting of the Association", 30 March 1927, JBAA, vol. 37, no. 6, pp. 193-205, 1927. "Eclipse Notices", JBAA, vol. 37, no. 6, p. 243, 1927. "Report of the Meeting of the Association", 25 May 1927, JBAA, vol. 37, no. 7, pp. 246-254, 1927. "Solar Section", JBAA, vol. 37, no. 9, pp. 342-343, 1927. "Photographic Section", JBAA, vol. 37, no. 9, pp. 348-350, 1927. "Report of Annual General Meeting of the Association", 26 October 1927, JBAA, vol. 38, no. 1, pp. 1-20, 1927. "Report of the Ordinary General Meeting of the Association", 30 November 1927, JBAA, vol. 38, no. 2, pp. 53-60, 1927. "Report of the Ordinary General Meeting of the Association", 25 January 1928, JBAA, vol. 38, no. 4, pp. 109-117, 1928. "Report of the Ordinary General Meeting of the Association", 29 February 1928, JBAA, vol. 38, no. 5, pp. 133-141, 1928. A M Newbegin, "The Total Solar Eclipse, 1927 June 29", JBAA, vol. 38, no. 7, pp. 204-209, 1928. "Solar Section", JBAA, vol. 38, no. 9, pp. 282-283, 1928. "Report of Annual General Meeting of the Association", 31 October 1928, JBAA, vol. 39, no. 1, pp. 1-19, 1928. "Solar Section", JBAA, vol. 39, no. 1, pp. 21-24, 1928. "Mr A F Bennett's Observatory, Leiston, Suffolk", MNRAS, vol. 88, pp. 286-7, 1928. A F Bennett, "Observation of the Transit of Mercury, 1927 November 10, at Leiston, Suffolk", MNRAS, vol. 88, pp. 486-487, 1928. "Minutes of the Meeting of the Newly Elected Board of Directors of the Astronomical Society of the Pacific, 26 January 1929", PASP, vol. 41, pp. 75-77, 1929. "Report of the Meeting of the Association", 27 February 1929, JBAA, vol. 39, no. 5, pp. 137-142, 1929. "Report of the Meeting of the Association", 27 March 1929, JBAA, vol. 39, no. 6, pp. 173-178, 1929. "Report of the Meeting of the Association", 29 May 1929, JBAA, vol. 39, no. 7, pp. 231-237, 1929. "Report of the Ordinary General Meeting of the Association", 26 June 1929, JBAA, vol. 39, no. 8, pp. 269-279, 1929. "Solar Section", JBAA, vol. 39, no. 9, pp. 340-341, 1929. "Report of the Meeting of the Association", 27 November 1929, JBAA, vol. 40, no. 2, pp. 64-71, 1929. A F Bennett, "A Spectroscopic Method of Determining the Times of Contact in the Case of a Solar Eclipse", JBAA, vol. 40, no. 2, pp. 81-83, 1929. "Mr A F Bennett's Observatory, Leiston, Suffolk", MNRAS, vol. 89, p. 355, 1929. "Report of the Meeting of the Association", 01 January 1930, JBAA, vol. 40, no. 3, pp. 97-111, 1930. "Report of the Meeting of the Association", 26 March 1930, JBAA, vol. 40, no. 6, pp. 185-197, 1930. "Computing Section", JBAA, vol. 40, no. 9, pp. 396-399, 1930. "Report of Annual General Meeting of the Association", 29 October 1930, JBAA, vol. 41, no. 1, pp. 1-17, 1930. "Mr A F Bennett's Observatory, Leiston, Suffolk", MNRAS, vol. 90, p. 416, 1930. "Report of the Meeting of the Association", 25 February 1931, JBAA, vol. 41, no. 5, pp. 215-219, 1931. "Report of the General Meeting of the Association", 24 June 1931, JBAA, vol. 41, no. 9, pp. 399-403, 1931. "Report of Annual General Meeting of the Association", 28 October 1931, JBAA, vol. 42, no. 1, pp. 1-15, 1931. "The Treasurer", JBAA, vol. 42, no. 1, pp. 51, 1931. "Report of the General Meeting of the Association", 30 December 1931, JBAA, vol. 42, no. 3, pp. 91-95, 1931. "Mr A F Bennett's Observatory, Leiston, Suffolk", MNRAS, vol. 91, p. 368, 1931. "Report of the General Meeting of the Association", 24 February 1932, JBAA, vol. 42, no. 5, pp. 163-165, 1932. "Meteor Section", JBAA, vol. 42, no. 6, pp. 206-210, 1932. "Report of the General Meeting of the Association", 27 April 1932, JBAA, vol. 42, no. 7, pp. 231-233, 1932. "Report of the General Meeting of the Association", 29 June 1932, JBAA, vol. 42, no. 9, pp. 315-321, 1932. "Officers and Council", JBAA, vol. 43, no. 1, front matter, 1932. "Candidates for Election as Members of the Association", JBAA, vol. 43, no. 1, pp. 36-37, 1932. "Candidates for Election as Members of the Association", JBAA, vol. 43, no. 2, p. 92, 1932. "Mr A F Bennett's Observatory, Leiston, Suffolk", MNRAS, vol. 92, p. 299, 1932. "Report of the General Meeting of the Association", 25 January 1933, JBAA, vol. 43, no. 4, pp. 143-148, 1933. "Report of the General Meeting of the Association", 22 February 1933, JBAA, vol. 43, no. 5, pp. 183-187, 1933. "Report of the General Meeting of the Association", 29 March 1933, JBAA, vol. 43, no. 6, pp. 233-240, 1933. "Candidates for Election as Members of the Association", JBAA, vol. 43, no. 7, p. 313, 1933. "Report of the General Meeting of the Association", 28 June 1933 JBAA, vol. 43, no. 9, pp. 355-361, 1933. "Report of the Annual General Meeting of the Association", 25 October 1933, JBAA, vol. 44, no. 1, pp. 1-16, 1933. "BAA Forty-Fourth Session, 1933-34, Officers and Council, JBAA, vol. 44, no. 1, p. iii, 1933. "Computing Section", JBAA, vol. 44, no. 2, pp. 52-61, 1933. "Mr A F Bennett's Observatory, Leiston, Suffolk", MNRAS, vol. 93, p. 265, 1933. "Report of the General Meeting of the Association", 27 December 1933 JBAA, vol. 44, no. 3, pp. 93-96, 1934. "Report of the General Meeting of the Association", 31 January 1934 JBAA, vol. 44, no. 4, pp. 133-138, 1934. "Report of the General Meeting of the Association", 28 February 1934 JBAA, vol. 44, no. 5, pp. 173-177, 1934. A F Bennett, "A 32-inch Reflector and its Mounting", JBAA, vol. 44, no. 5, pp. 182-185, 1934. "The Association Dinner", JBAA, vol. 44, no. 7, pp. 278-279, 1934. "Report of the General Meeting of the Association", 30 May 1934 JBAA, vol. 44, no. 8, pp. 289-294, 1934. "Report of the General Meeting", 27 June 1934 JBAA, vol. 44, no. 9, pp. 325-330, 1934. "The Ordinary General Meeting of the Association", 31 October 1934 JBAA, vol. 45, no. 1, pp. 16-19, 1934. "Officers and Council", JBAA, vol. 45, no. 1, p. 20, 1934. "Candidates for Election as Members of the Association", JBAA, vol. 45, no. 1, pp. 51-53, 1934. "Report of the General Meeting of the Association", 28 November 1934 JBAA, vol. 45, no. 2, pp. 55-67, 1934. "Mr A F Bennett's Observatory, Leiston, Suffolk", MNRAS, vol. 94, p. 318, 1934. "Computing Section", JBAA, vol. 45, no. 3, pp. 104-113, 1935. "Variable Star Section", JBAA, vol. 45, no. 4, pp. 145-150, 1935. "Report of the General Meeting of the Association", 27 March 1935 JBAA, vol. 45, no. 6, pp. 223-232, 1935. "The Association Dinner", JBAA, vol. 45, no. 7, pp. 291-292, 1935. "Report of the General Meeting of the Association", 26 June 1935 JBAA, vol. 45, no. 9, pp. 339-346, 1935. "Candidates for Election as Members of the Association", JBAA, vol. 45, no. 9, pp. 383-384, 1935. "Report of the General Meeting of the Association", 27 November 1935 JBAA, vol. 46, no. 2, pp. 57-63, 1935. "Mr A F Bennett's Observatory, Leiston, Suffolk", MNRAS, vol. 95, pp. 378-9, 1935. "Report of the General Meeting of the Association", 25 March 1936 JBAA, vol. 46, no. 6, pp. 217-226, 1936. A F Bennett, "A Comparison of Observatory Sites", JBAA, vol. 46, no. 6, pp. 229-230, 1936. "Report of the General Meeting of the Association", 29 April 1936 JBAA, vol. 46, no. 7, pp. 249-254, 1936. "Report of the General Meeting of the Association", 24 June 1936 JBAA, vol. 46, no. 9, pp. 313-321, 1936. "Candidates for Election as Members of the Association", JBAA, vol. 47, no. 2, p. 94, 1936. "Mr A F Bennett's Observatory, Leiston, Suffolk", MNRAS, vol. 96, p. 337, 1936. "Candidates for Election as Members of the Association", JBAA, vol. 47, no. 5, pp. 201-202, 1937. "BAA Forty-Seventh Session, 1936-37, Officers and Council", JBAA, vol. 47, no. 5, pp. i, 1937. "For Sale - The Observatory and Equipment of the Late A F Bennett of Leiston", JBAA, vol. 47, no. 8, pp. ii, 1937. "Report of the General Meeting of the Association", 26 May 1937 JBAA, vol. 47, no. 8, pp. 281-289, 1937. "The Late A F Bennett", 26 May 1937 JBAA, vol. 47, no. 8, p. 309, 1937. "Arthur Frederick Bennett", JBAA, vol. 47, no. 9, pp. 333-334, 1937. "Solar Section", JBAA, vol. 47, no. 10, pp. 348-349, 1937. "Computing Section", JBAA, vol. 47, no. 10, pp. 370-375, 1937. "In Memory of the Late Mr A F Bennett", JBAA, vol. 48, no. 1, p. 45, 1937. "Report of the General Meeting of the Association", 24 November 1937 JBAA, vol. 48, no. 2, pp. 47-55, 1937. "Computing Section", JBAA, vol. 48, no. 5, pp. 199-203, 1938. "Instruments Belonging to the Association", JBAA, vol. 48, no. 10, pp. 396-400, 1938. "Computing Section", JBAA, vol. 49, no. 1, pp. 30-33, 1938. Ordnance Survey, "A Guide to Coordinate Systems in Great Britain", v1.6, May 2006. Filed in a letter from Bennett to Basil Brown held by Suffolk Record Office, holding GC14/2 (history of Astronomy).